An easy to follow guide to better men's health that is full of humor, insight, and quality information. Buy now and have it downloaded directly to your Kindle device or mobile app. Men die younger than women yet even men do not seem to be alarmed by this. While we encourage women to continue to improve their health, we desperately need men to get into the medical “game”. Men are notorious for not going to the doctors unless there is a blood spurting reason. Men Die Young, Women Don’t Care is intended to be used as a tool to encourage and enable men to get checked before it is too late. Written by a sports medicine doctor, it may be just the method to get guys to get that check up and become lean and fit. With real life examples, written in non threatening way, this book should be given to all men you care about. Real men should go to the doctors and this may just be the trick to getting them to show their “tender underbellies”. Gerardo "Jerry" Hizon,MD,FAAFP,CAASM is co-founder and medical director for the OUCH Sports Medical Center. He attended the University of California, San Diego School of Medicine and was Chief Resident in family medicine at the University of California,Irvine Medical Center. Dr. Hizon obtained his Certificate of Add Qualification in sports medicine through UCSD in 1993. He currently is a volunteer assistant clinical professor in the Department of Community Medicine at UCSD with the Sports Medicine Fellowship Program. In 1986, Dr. Hizon begain private practice in Temecula, California and in 2011, Dr. Hizon and his partner Dr. Brent Kay established OUCH Sports Medical Center in Murrieta. In 2005, the office was moved into its current location in Temecula. Besides private practice, Dr. Hizon has served as medical team physican for the San Diego Chargers(NFL) since 1999 and was chosen to be a sideline physician for the 2003 Superbowl between Tampa Bay and Oakland. In 2010, Dr. Hizon was chosen to be a medical team physician for the NFL Pro Bowl in Miami. As an author of various medical articles,book chapters and his current book,"Men Die Young, Women Don't Care: How to Improve Men's Health", Dr. Hizon has lectured nationally and won a national award from the AAFP for his "Family Practice in Sports Medicine" presentation. He was awarded the "Sports Medicine Champion" award in 2009 as the top sports medicine of the year by the San Diego Sports Medicine Foundation. In the past he has served as team physician/medical director for the San Diego Gulls(IHL Hockey), San Diego Buick PGA Golf Tournaments, Carlsbad 5000 races, Palomar College(Winning the National Championship in 1993) and the Bud-Lite Tiathalon series. As an active member in the community, Dr. Hizon celebratd his 25th year as the volunteer team physician for the Temecula Valley High School Golden Bears in 2011. Through the years, he has helped perform approximately 4,500 pre-participation sports examinations for various schools and teams in the area,with proceeds going directly to the individual schools. This year's sports exams raised $25,000 for the various Temecula Valley Schools. He was founder of the Murrieta Half Marathon, has completed six full marathons (pr 3:05) and was assistant scout master in Boy Scouts. In 2008, his scouts completed the rigorous Silver Moccasin Trail (53 mile backpack in the Angeles Forest) and in 2009 successfully climbed Mt. Whitney (14,500 ft). Over the past two years he has finished multiple century(100 mile) road cycling rides and won his age group in the 2011 Temecula Challenge 75 mile road time trial. He is currently a member of the American Academy of Family Physcians, American College of Sports Medicine, The NFL Team Physician Society, and is the President Elect of the Riverside County Medical Association. I was a skeptic on the whole idea of this famous doctor knowing how to change my life and live longer and healthier. After many years of athletic competition, I am an aging business executive that has had diet and exercise drummed into me since childbirth. Each week is a new diet or exercise gimmick. The media showers me with every kind of propaganda from ab busters to hanging upside down like an monkey. This easy read, not too expensive book, tells in a funny way things like "Great abs come from the kitchen". In other words, yes it is what you eat. This no nonsense practical approach to health doesn't take away my Cherry Garcia before bed, just limits it to one night a week. Excercise done in a fun fashion within my hectic schedule has always been a challenge. 3 years ago I was a broken down ex-football player, that had Atrial Fibrilation, fat, high blood pressure, hypertension, you name it bad, that was me. Today I am very happy at 6"3" 215 (I don't run the 40 in 4.8 anymore), but I do mountain bike and live a balanced life. As a former triathlete I was always an all or nothing. I have watched the author go through similar life experiences and the chapters you will read resonate with his life experiences that are transformational. Have fun and don't take life so serious. I recommend you enjoy this book and take the kernels of wisdom and apply them if you want to change your life! 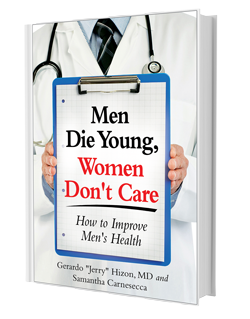 In writing MEN DIE YOUNG, WOMEN DON'T CARE, Dr. Hizon hits the nail on the head without really trying. Explained in direct, no-nonsense manner, his guide to good health doesn't take any prisoners and doesn't care, let the junk food afficionados ignore the advice and die with their secrets. Although it should be no big news to anyone that proper eating and exercise are the foundation of good health and longevity, more words of wisdom are packed in this book than anyone should be allowed to ingest in one reading. In a strange twist of fate, it was a good day when I busted my shoulder during Aikido practice a few years ago. Dr. Hizon's decisive attention and sound recommendation to a top surgeon for immediate surgical arthroscopy saved my chances at resuming my martial arts training and eventually prompted me to put my physical wellbeing into his hands. This book certainly is an added tool to anyone wishing to live a long healthy life. 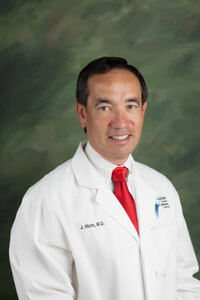 © Copyright 2012 Jerry Hizon, M.D. All rights reserved.